AUCD has again partnered with Guidebook to bring you the entire conference agenda and more on your mobile device, for free! Download the guide to plan your day with personalized schedules, browse exhibitors, view maps of the hotel and surrounding area, view the attendee list and connect with people before you arrive, access exclusive online content, and much more. The app is compatible with iPhones, iPads, iPod Touches and Android devices. Windows Phone 7, laptop, and Blackberry users can access the same information via amobile site. Download 'Guidebook' for free from the Apple App Store or the Android Marketplace. Once installed, search for and download the guide "AUCD 2015". Visit https://guidebook.com/g/4cql278n/ and follow the instructions. Access this page on your mobile device, then click the image below. Download these 2015 AUCD Conference Mobile APP Accessible Instructions. Find and tap the App Store icon on your phone's home screen. This will take you to the App Store so you can install Guidebook for free. Using the store's search feature, search for "Guidebook." Tap the guidebook icon (it's light blue with a white lower case g on it) to install it to your device. If you don't want to install it, just tap somewhere else on the page. When you've installed Guidebook app, it will appear on the home screen of your device. Now use the "Guidebook" app by tapping it. Across the top is a white "search" bar. 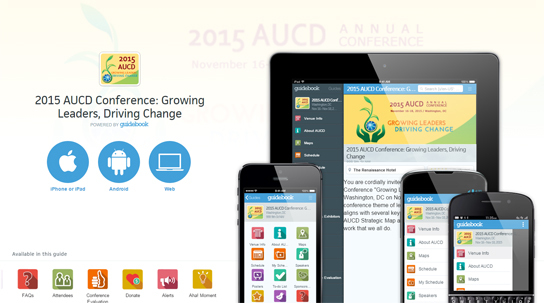 Type in "AUCD" and you'll see the yellow 2015 AUCD Conference app appear. Tap that icon to download the full information to your device. Each time you want to use the app, tap Guidebook from your homescreen, then the yellow 2015 AUCD Conference will appear. Find and tap the Play Store icon on your phone's home screen. This will take you to the Google Play Store so you cna install Guidebook for free. Using the store's search feature, search for "Guidebook,"
Tap the guidebook icon (it's light blue with a white lower case g on it) to install it to your device. If you don't want to install it, just tap somewhere else on the page.The details screen will appear, and you can read more about the app and its features. Tap the "download" button to install Guidebook, then tap "accept and download." When you've installed the Guidebook app, it will appear on your home screen of your Android device. If you need help downloading the app or have questions about it or it's contents, email your question(s) to Ashley Mason, Meeting Intern, or ask any AUCD staff member at the conference.